I hope you’re excited to play along with our new Block of the Month series here on the Polka Dot Chair Blog. 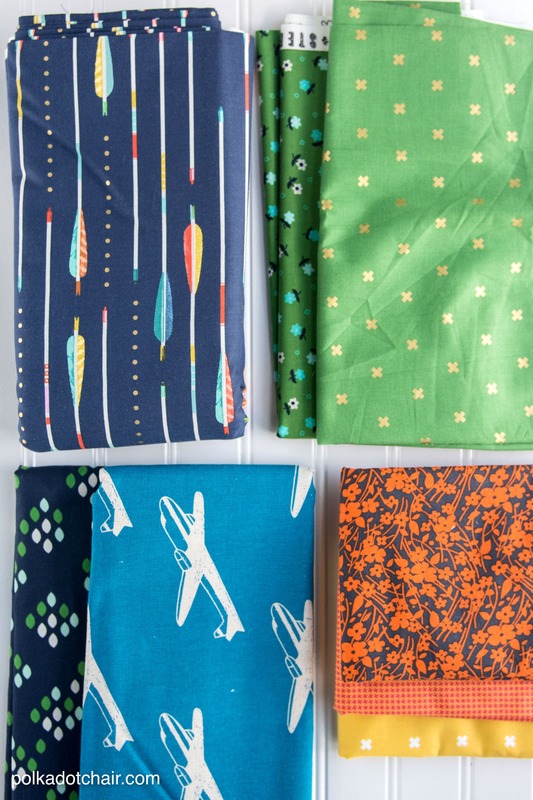 Whether you get your fabric online, on sale, or in a shop, buy yards at a time or just a fat quarter, you’re going to need to know how to pick fabrics for a quilt that coordinate with each other. 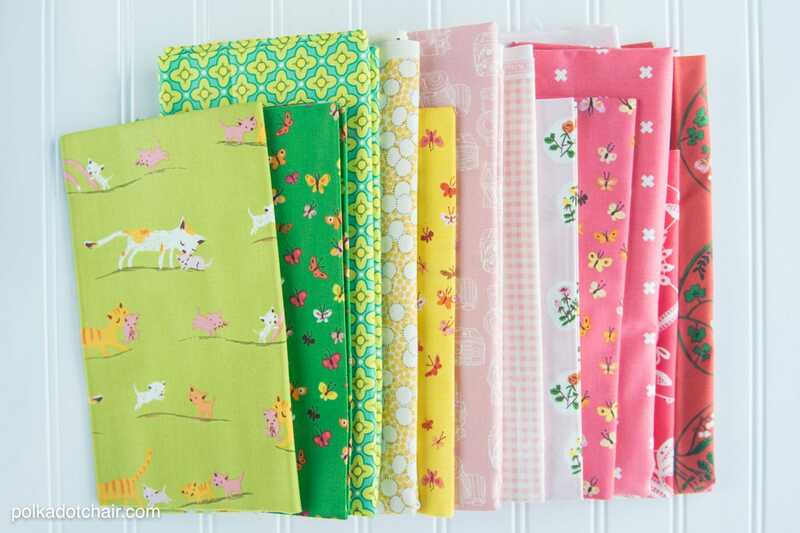 Today we are going to chat a bit about how to choose what fabric (and what colors of fabric) to use in your quilt. To view ALL of the posts in the Block of the Month series, JUST CLICK HERE for the Archive. That link contains all of the projects posted to date. 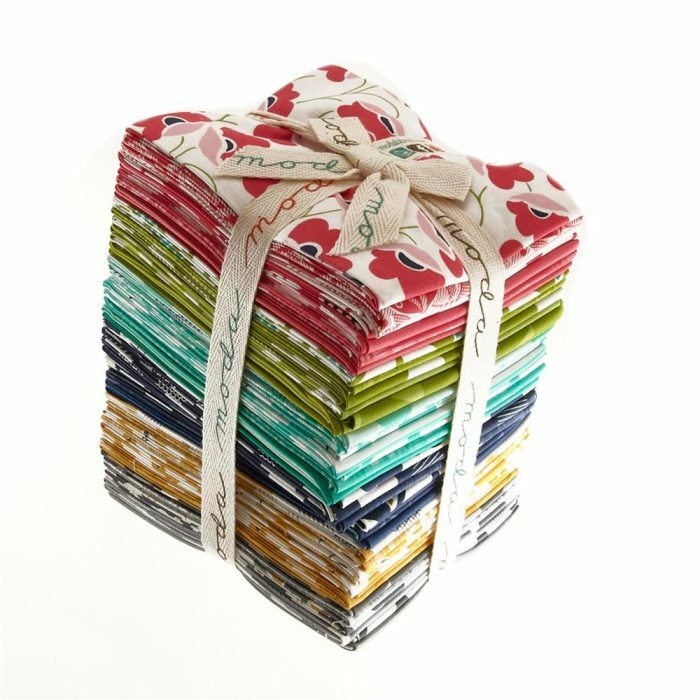 Are you anxious to get started on this months quilt block for our new series? I hope so! I was so excited to see all of your positive comments when I announced the series! Before you get started you’re going to need some fabric! Today I’m going to cover how to pick out the fabric for your quilt (and about how much to buy). Then next week we will go over some very basic quilting techniques and then end the month with our first block! In subsequent months I’ll just post the block and refer back to the “how to” posts for reference, so things will be a bit more speedy in October. Okay, so what should you buy and where should you get it? You want to buy a high-quality quilting cotton, you can get that type of fabric at your local quilt shop. Not sure if you have one in your city? Just google your city name and “quilt shop”. Something will pop up. If you visit your local shop and get stuck there will be lots of people there willing to help you out. 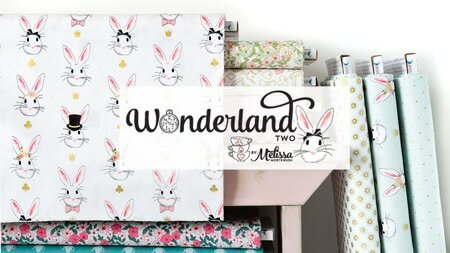 If you’ve got a good idea what you want you can also order your fabric online. There are many many shops out there that can help you out. 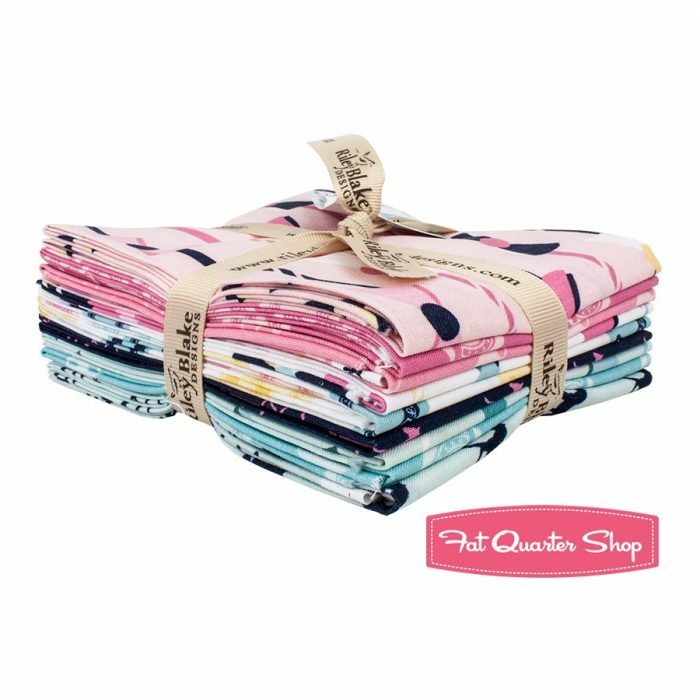 I’ve ordered from the Fat Quarter Shop a lot (and grabbed a few images off of their site to use today). Next, let’s talk about COLOR. This quilt will be constructed one block at a time over the course of a year. Before you start you need to have a plan of where it’s all going or you might not be super happy with the outcome. When discussing color there are a lot of different things we can chat about. We can talk about the color wheel, monochromatic colors, contrasting colors, color theory etc… I could go on for hours. Instead of that let’s take the shortcut okay? 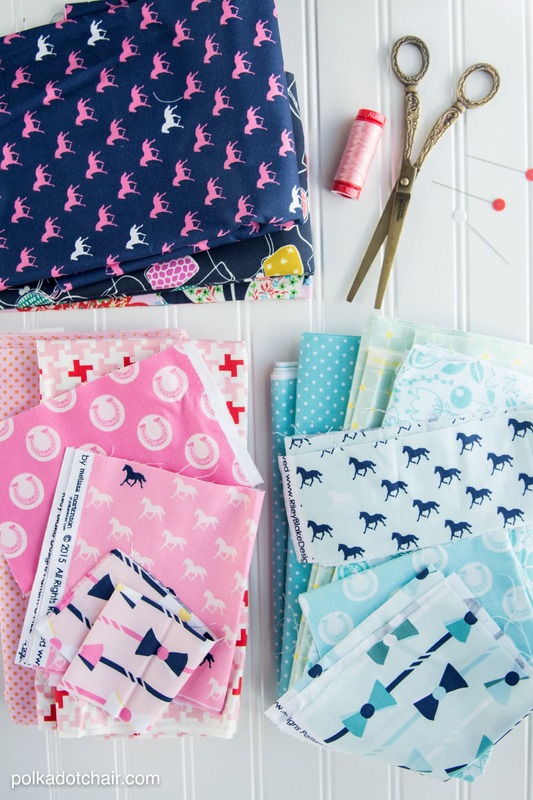 Find ONE fabric that you LOVE… all you need is one. Now take that fabric and use that as your jumping off point for your color palette. 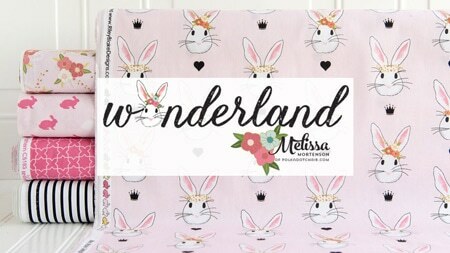 For one of my quilts, I am using the color scheme from this Heather Ross print as a jumping off point. Reds, corals, blush pinks, deep yellows & leaf greens. You can see my fabric pull for this scheme above. What Fabric Should I use for the Background of the Quilt? Next, you need to pick your background fabric. It can be plain white, dark grey, or what is referred to as “low volume”. Low volume fabrics are fabrics that have very little visual impact when you look at them. 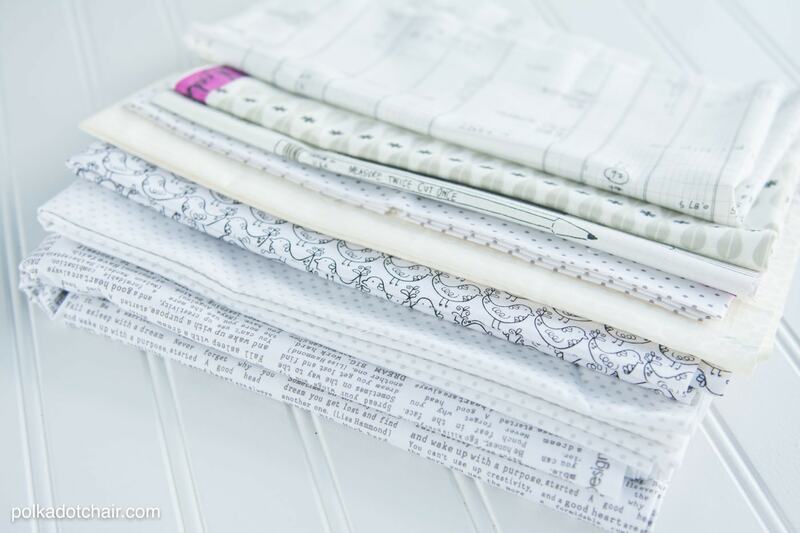 Think text fabrics, or white fabric with simple monochromatic designs. They read as light but have a secondary pattern. If you squint your eyes or look at them from far away you might assume it’s a solid color fabric. They don’t always have to be black and white, but for my quilt I’m going to stick to black, white and gray low volume fabrics. Note: If you are going to use low volume fabrics as your background, make sure that your “feature” fabrics are all HIGH contrast to the low volume. They should be bright and saturated in order for the pattern to stand out. This quilt is going to be a “seasonal” quilt but only subtly… think one tiny pumpkin hid inside the block.. A kind of “I spy or Where’s Waldo” quilt in seasonal form, but not “in your face” seasonal… you’ll understand more when you see the block. Okay, that’s my pick for block #1. I could not do a block of the month series and not use some of my own fabric right??? Drawing from my color palette for Derby Style, my second quilt will have pinks, aquas and navy blues. 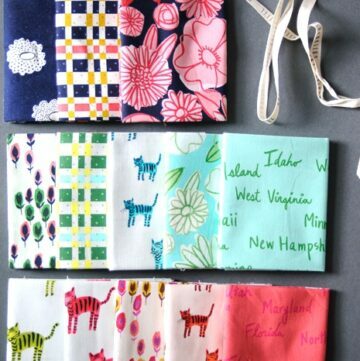 Here’s an example of the fabrics along with a few others from my stash. This quilt will have a solid white background. 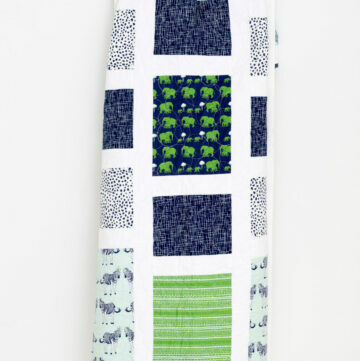 My 3rd quilt will be for my teenage son, I’m going to stick to mostly navy blues and oranges. I’m still on the fence about the background on this one but am leaning towards a nice charcoal gray. I’m in LOVE with this quilt that Amy is working on and might go in that direction. I know more after I hit the quilt shop this weekend. 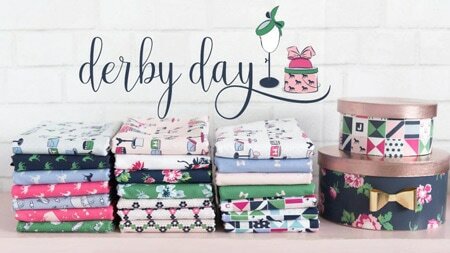 DO NOT go out and buy gobs of fabric (unless you want too). 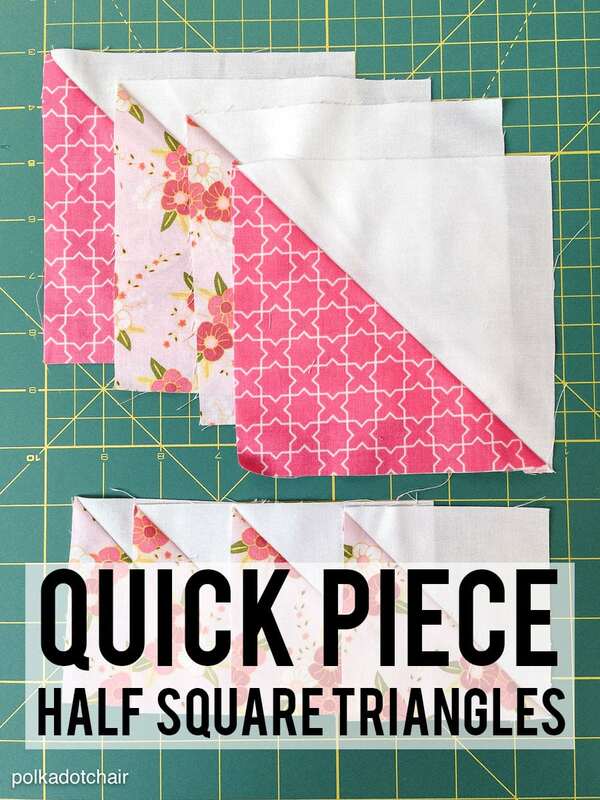 Most blocks will require only a few fat quarters. If you are using a color for your background (or plain white) then buy about 2 or 3 yards of that color all at once (you don’t want to run out and not be able to find more). For the colorful parts of the blocks, you can buy them as you go (once you decide on a color palette). If you’re totally stuck then I’d recommend buying a fat quarter pack. What is a Fat Quarter Pack? 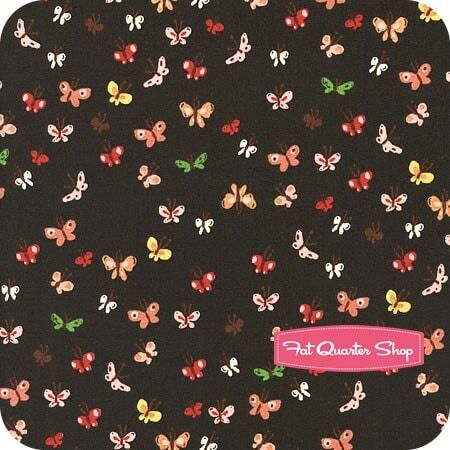 A fat quarter is a piece of fabric cut to 18″ x 22″, essentially a quarter yard of fabric. They are all color coordinated by the designer of the fabric so you know that they work well together. 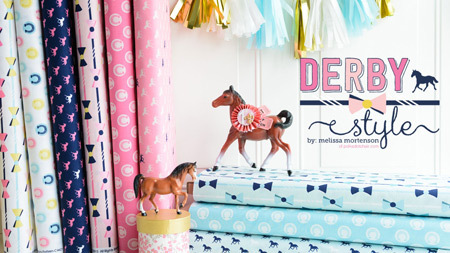 You can also add more fabrics as the year goes on. That’s enough for today!! 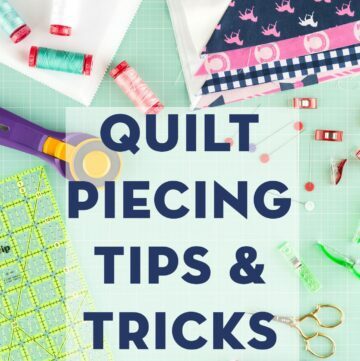 Watch for basic quilting techniques post next week!! So…I’m confused on background color a little bit without seeing an example. I get it for, say, an art quilt where the background is like the background of a painting. But if you’re making blocks don’t you just sew them all together or do you sew them on top of a background? I feel like a bit of an idiot, but do you have an example or diagram? Thanks! Look at this pin and it might help you visualize it. It’s not a block that we are making but gives you a good idea of what is meant by background fabric. https://www.pinterest.com/pin/207095282841961463/ The blocks will be pieced (with the exception of 1 or 2 applique blocks) so you sew the background when you sew the block, you don’t sew them on top of the background… its a different process than constructing an art quilt. thanks for doing this! i am totally going to attempt this as i can’t get big projects done right now. this will help me take it one step at a time. we need to talk em into doing this too! I was having trouble pulling fabric for an upcoming project and read your excellent post and it has really helped. So thank you Melissa for sharing with everyone your knowledge! Just looking at your well thought out picks helped me decide on what to do myself! I cannot find a link to the patterns for either block. I am confused… but, that is my usual state, so…. Oops… I misunderstood… you haven’t posted the patterns yet. To get started yes I think. You might want to add more as the year goes along, but it would be more than enough for the first few blocks. Love the tutorial! 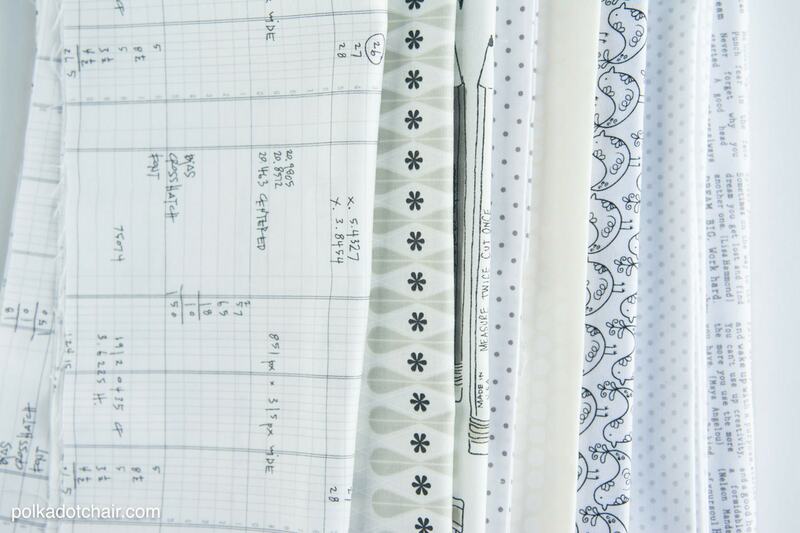 What is the white fabric with the graph paper and equations? I have been liking for something just like this! Thanks! I have been told that one MUST wash all fabric before starting to cut… I did and this was a disaster. The fabric had to be starched and ironed…. I am a card carrying lazy person. What if i chose not to wash it first? I NEVER prewash… so be lazy all you want! I love looking at cloth samples for my projects. I just wish that there was a way to feel the samples through my computer screen. It’s hard to go to a store and find a pattern that’s close to what I want but I can’t touch the fabric on the internet. 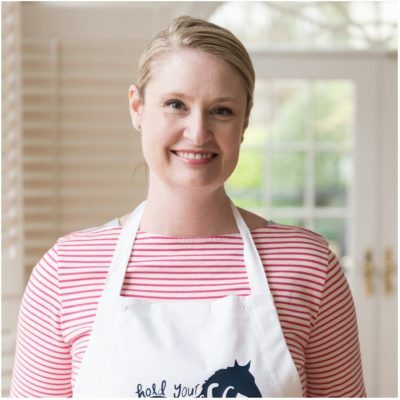 I love, love, love your blog and ideas! I’m a newbie quilter (2 quilts under my belt!) and would love to continue to work on my skills and learn new patterns. 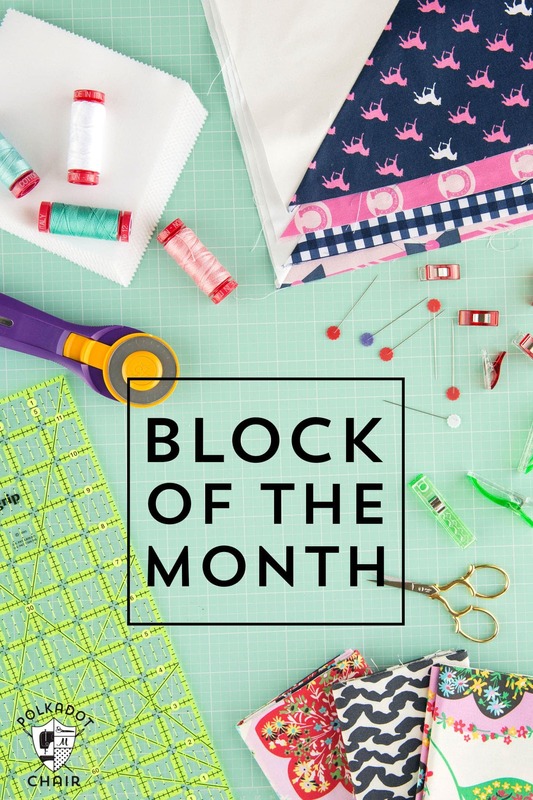 I love your block of the month from last year and was wondering if you’ll be starting another one soon. I have friends who would like to join me, too! Thanks for all of your inspiration! Hello, I have never made a quilt before, I love railroad history and I found a used book called “Hobo Quilts”. I want to make a wall hanging for a dear friend of mine who loves trains as I do, and I want to make it like the book cover, with dusty type colors. I could take the book with me to buy fabric, but thought I would ask your advice about it. I don’t think I will find these patterns in a fat quarter. Any suggestions?